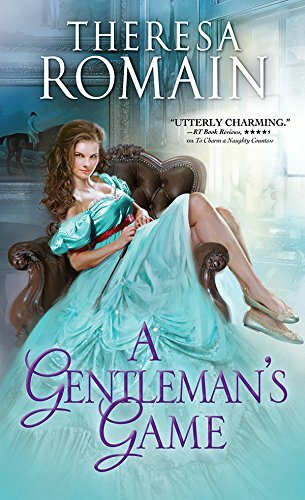 A Gentleman's Game is a very different kind of romance novel. While it takes place firmly within the Regency Period, it is worlds away from any other Regency novel. First off, the hero is the younger son of a minor aristocrat whose title only goes a few years back (rather than all those Dukes that can trace their titles back to Agincourt). It was not at all what I expected it to be and I'm still not fully sold on it or on the romance between the lead characters. Nathaniel Chandler is the younger son of a minor aristocrat and he doesn't really know who he is to his family. He's not the heir and his father doesn't trust him to take part in the family business--horse racing. After asking his father to let him take the horses to Epsom for the Derby, he doesn't expect to be told to take along his father's secretary, Rosalind Agate. He likes Rosalind, but the fact that his father trusts her more than he trusts him upsets him more than he wants anyone to know. Rosalind Agate is not who she claims to be--the only true thing about her is her name. She's only working for Sir William Chandler because she needs to find paperwork for her real employer, so leaving Newmarket to travel across England with his son is the last thing she wants to do. Until Nathaniel promises to stake a wager for her. 150 pounds. The price of her freedom. I should be jumping up and down over this book, but I'm not. I don't know why. It was written well. Ms. Romain has an engaging voice and both her main characters are likable enough. There's just something missing. The only thing I can think of is that I didn't fully believe that they were truly in love. Yes, there were feelings involved and they were both depressed at being separated, but it all happened too fast. One minute he's buying her sugared almonds and kissing her senseless and the next they're all each other can think of--it kind of left my head spinning. I was also disappointed in how little there was involving the horses. This series is supposed to involve horse racing, but this was mostly background here. The Derby was almost an afterthought (and while horse racing tends to be an afterthought for me in most cases, I wanted to see more of this here). I was more than a little disappointed in this turn of events. There was also a suspense plot (of a kind) involving Rosalind and the person she was actually working for throughout the narrative. It was fairly predictable and could have been handled better. I saw the result coming from about a mile away, and honestly only a blind person would not have seen it. This isn't to say that there weren't aspects that I liked. I enjoyed the banter between Rosalind and Nathaniel, although once they were on the road most of that went away. They joked with each other in Newmarket and then in the Chandler home in London, but there wasn't much of it at any other point. I also like that Nathaniel was a flawed hero. He wasn't perfect and part of who he is was based around a problem that most people wouldn't have considered an issue at that time (and many people still have problems thinking of this as something real). I liked the way this was handled. It could have been brushed aside very easily and I was glad that it wasn't.